As compared to September last year, the growth momentum of price indexes shows visible strengthening. Year on year, the rate of growth of the consumer price index (CPI) rose to 1.6 percent in January from 1.5 percent in the month before and 1.1 percent in September last year. 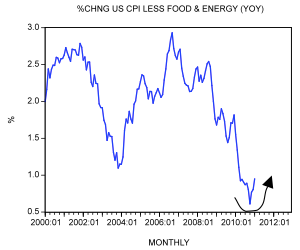 Also the growth momentum of the consumer price index less food and energy has strengthened in recent months. The yearly rate of growth climbed to 1 percent from 0.8 percent in December and 0.6 percent in October. Economists blamed the increase in price indexes on the higher prices of apparel, airline fares, and shelter costs. Note that attempting to explain general increases in prices in terms of the components of the price index is not an explanation, because it doesn't address the key causes. Is Inflation about Price Rises? The fundamental problem here is a failure to define the problem properly. The essence of inflation is not a general rise in prices as such but an increase in the supply of money, which in turns sets in motion a general increase in the prices of goods and services. As Mises explained in his essay "Inflation: An Unworkable Fiscal Policy,"
As you cannot talk about something that has no name, you cannot fight it. Those who pretend to fight inflation are in fact only fighting what is the inevitable consequence of inflation, rising prices. Their ventures are doomed to failure because they do not attack the root of the evil. They try to keep prices low while firmly committed to a policy of increasing the quantity of money that must necessarily make them soar. As long as this terminological confusion is not entirely wiped out, there cannot be any question of stopping inflation. Now a price of a good is the amount of money asked for the good. Hence for a given amount of goods the more money is in the economy, the higher the amount of money per good spent is going to be, all other things being equal. This means that for a given amount of goods, an increase in the money supply, i.e., the amount of dollars, all other things being equal, must lead to more dollars spent per unit of a good, i.e., a general increase in prices of goods. When inflation is seen as a general rise in prices, then anything that contributes to price increases is called inflationary. It is no longer the central bank and fractional-reserve banking that are the sources of inflation, but rather various other causes. In this framework, not only does the central bank have nothing to do with inflation, but, on the contrary, the bank is regarded as an inflation fighter. Thus, a fall in unemployment or a rise in economic activity is seen as a potential inflationary trigger which therefore must be restrained by central-bank policies. Some other triggers, such as rises in commodity prices or workers' wages, are also regarded as potential threats and therefore must always be under the watchful eye of the central bank. 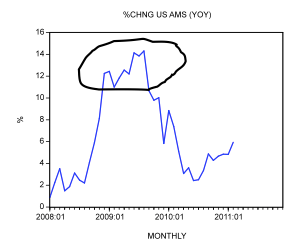 We suggest the Fed's massive pumping during 2008 to September 2009, and the consequent increase in the growth momentum of the money supply (AMS), is the key factor behind the present strengthening in price inflation. 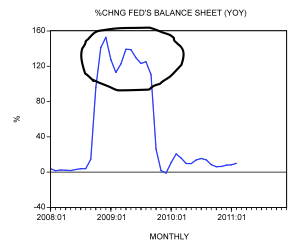 Observe that the yearly rate of growth of Fed's balance sheet stood at 153 percent in December 2008 whilst the yearly rate of growth of AMS jumped to 14.3 percent in August 2009. If inflation is just a general rise in prices, then why is it regarded as bad news? What kind of damage does it do? Mainstream economists maintain that inflation, which they label as general price increases, causes speculative buying, which generates waste. Inflation, it is maintained, also erodes the real incomes of pensioners and low-income earners and causes a misallocation of resources. Despite all these assertions regarding the side effects of inflation, mainstream economics doesn't tell us how all these bad effects are caused. Why should a general rise in prices hurt some groups of people and not others? Why should a general rise in prices weaken real economic growth? Or, how does inflation lead to the misallocation of resources? Moreover, if inflation is just a rise in prices, surely it is possible to offset its effects by adjusting everybody's incomes in the economy in accordance with this general price increase. However, if we accept that inflation is an increase in the money supply, and not a rise in prices, all these assertions can be easily explained. It is not the symptoms of a disease but rather the disease itself that causes the physical damage. Likewise, it is not a general rise in prices but increases in the money supply that inflict the physical damage on wealth generators. Increases in the money supply set in motion an exchange of nothing for something. They divert real funding away from wealth generators toward the holders of the newly created money. This, not price rises as such, is what sets in motion the misallocation of resources. Moreover, the beneficiaries of the newly created money — i.e., money created "out of thin air" — are always the first recipients of money, who can divert a greater portion of wealth to themselves. Obviously, those who either don't receive any of the newly created money or get it last will find that what is left for them is a diminished portion of the real pool of funding. Furthermore, real incomes fall, not because of general rises in prices, but because of increases in money supply; in other words, inflation depletes the real pool of funding, thereby undermining the production of real wealth — i.e., lowering real incomes. General increases in prices, which follow increases in money supply, only point to the erosion of money's purchasing power — although general rises in prices by themselves do not undermine the formation of real wealth as such. Contrary to popular thinking, the Fed's preoccupation with maintaining price stability by keeping the CPI rate increases at a particular acceptable range, such as 2 percent, can actually generate nasty surprises. For instance, as a result of strong monetary expansion and a correspondingly strong increase in the production of goods, prices remain stable. Notwithstanding this stability, various nasty side effects are likely to emanate from monetary expansion. Hence we suggest that Fed policy makers should pay close attention to the sources of monetary inflation rather than focusing on the symptoms of inflation. The fact that general prices were more or less stable during the 1920s told most economists that there was no inflationary threat, and therefore the events of the Great Depression caught them completely unaware. When money is injected into the economy, it never affects the prices of goods instantly. Because money moves from one market to another market there is a time lag. 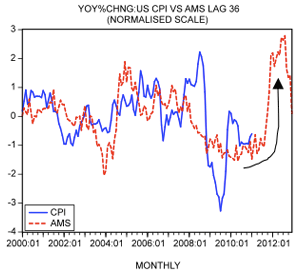 We have estimated that in the United States it takes about 36 months before changes in money supply generate a visible effect on the prices of goods in general. It must be emphasized that the lags are variable, i.e., in some periods the time lag could be less than 36 months, in some other times it could be more than 36 months. 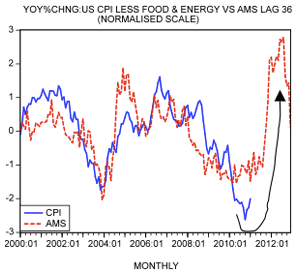 Based on past massive monetary pumping and using the time lag of 36 months, we can suggest that the growth momentum of the full CPI and the CPI less food and energy is likely to visibly strengthen in the months ahead. We forecast that the yearly rate of growth of the CPI could rise to 2.4 percent by September before jumping to 4.4 percent by December. Year on year, the rate of growth of the CPI less food and energy is forecast to climb to 1.5 percent by September before climbing to 2.7 percent in December. The message from our monetary analysis that there is a growing risk of acceleration in price inflation in the months ahead. 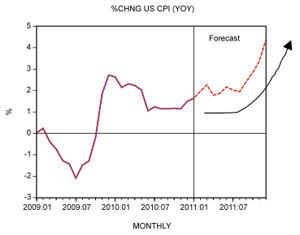 Since September last year, the growth momentum of the US consumer price index (CPI) has displayed visible strengthening. 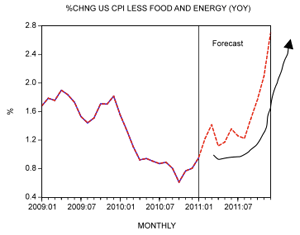 We suggest that the Fed's massive monetary pumping during 2008 to September 2009 is the key factor behind the strengthening in price inflation. 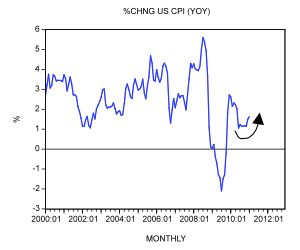 Based on past monetary pumping, we expect the growth momentum of the CPI to strengthen further. © 2010 Copyright Frank Shostak - All Rights Reserved Disclaimer: The above is a matter of opinion provided for general information purposes only and is not intended as investment advice. Information and analysis above are derived from sources and utilising methods believed to be reliable, but we cannot accept responsibility for any losses you may incur as a result of this analysis. Individuals should consult with their personal financial advisors.